ASHEVILLE, N.C. - July 30, 2015 - PRLog -- The burgeoning market of short-term rentals (also called vacation rentals) has gained national attention in the past year, in part due to a complex patchwork of regulations, enforcement, and standards of conduct. Many cities have been actively working to find a solution that treats homeowners, neighbors, and travelers fairly. While the wheels of bureaucracy turn slowly, one company in Western North Carolina is creating solutions - with great success. Carolina Mornings, Inc. (http://www.CarolinaMornings.com), founded in 1997 by owner and CEO Shari Goldstein, has grown steadily from a handful of properties to an inventory of over 100. Ms. Goldstein has combined her spirit of community with her business acumen to secure a leading role in the Asheville area’s vacation rental market. Throughout the years, Carolina Mornings’ leadership team has proactively sought solutions to ensure that their vacation travelers and the neighbors of rental properties are a benefit to each other. By working closely with neighbors and guests, participating in community forums, and enforcing “good tenant” policies, Carolina Mornings continues to enjoy unprecedented growth while protecting neighborhood integrity. The numerous awards and continual growth achieved by Carolina Mornings illustrates the close relationship that the management company maintains with its property owners, guests, and the community. 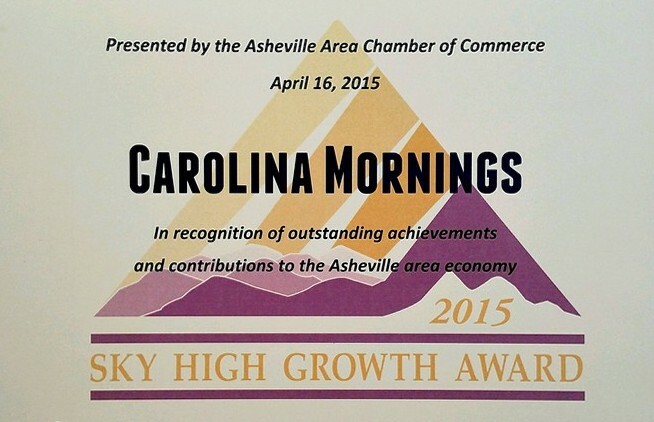 As a six-time recipient of the Asheville Chamber of Commerce’s “Sky High Growth Award,” Carolina Mornings has been able to experience this high level of success brought about by responsible and ethical business practices. Carolina Mornings has clearly found a recipe for success which is paying dividends to those who participate in their program. In an industry where competition and regulations are growing rapidly, Carolina Mornings is raising the bar of success in the Asheville area’s short-term vacation rental market. About Carolina Mornings: A leader of excellence in luxury mountain experiences, Carolina Mornings has a highly sought after selection of the finest vacation homes in the Asheville, NC area. Whether you choose to stay in a captivating Blue Ridge Mountain chalet, a Smoky Mountain log cabin, an elegant downtown loft or a luxury vacation villa located at the center of Historic Biltmore Village, you will be showered with personal attention, exceptional service, and superior amenities. Our Asheville, NC vacation rental cabins and homes offer spectacular mountain views with unrivaled amenities. We are also proud to offer a wide selection of executive and pet-friendly rentals. Carolina Mornings is truly your best choice for finding your luxurious Western North Carolina cabin, cottage, condo or vacation home rental. For more information, call 888-578-6561 or visit http://www.CarolinaMornings.com. *The Asheville CVB growth numbers are as reported by Asheville’s Convention and Visitors Bureau Visitor Index report. STR Revenue and Explore Asheville visits are based on the Bureau’s fiscal year, which covers July to December only. The room night (demand) growth is based on January to December. All of Carolina Mornings numbers are based on matching time frames to provide the most accurate comparison possible.